The warmth, texture, and pattern of wood porcelain planks have come a long way since they first made their appearance, and now there is a new kid on the block. Make no mistake about it, the hex appeal is real. We love our stone hexagon designs, but this Wood Look Hexagon Tile is so versatile and durable for most flooring and wall applications. 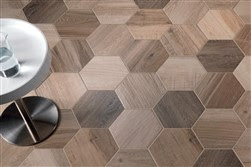 Warm up your space with these large format hexagons in your living room, and their size and shape make for the perfect flooring in your bathroom. Not only will this pattern help with slip resistance, you can have the look of real wood inlay without the added expense. 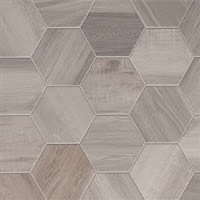 With its low pricepoint and high durability (which is what porcelain tile is known for!) 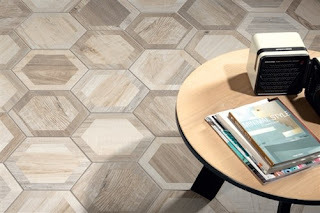 these Wood Look Hexes just might be the perfect tile for your home renovation. The realistic wood grain and contrasting inlay looks best with a complementary larger format tile, or you can go for classic subways on your shower walls. 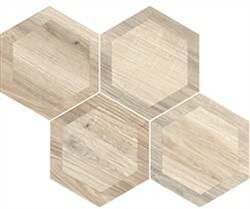 Treat these Wood Look Hexagons just as you would porcelain planks, and install them indoors or carry them out onto your patio. Their unique design is offered in an 8” inlay or 8” format without an inlay, and available in various warm wood tones. 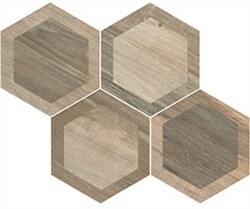 Wood Look Hexes accommodate several different styles such as transitional, traditional, eclectic, and contemporary designs. The possibilities are endless with this kind of design freedom, and you can let your style and personality shine with the rest of the finishes and furnishings! Wood Look Hexes allow for you to change up the design of your home over the years without compromising style.